The spirit of Christmas narrated! From Julie of Santa Monica, California on 1/23/2012 . Outstanding, excellent, superb. 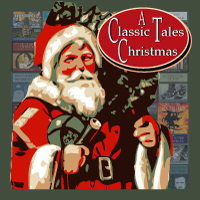 A magnificent collection of Christmas stories told lovingly by a dedicated narrator, B.J. Harrison. This collection is the epitome of the Christmas spirit! From Mark of Eugene, Oregon on 12/29/2011 . Some wonderful stuff, some plane odd. Cricket on the Hearth is Dickens at his most painful. From Anonymous of Portland, Oregon on 12/28/2011 . I bought A Classic Tales Christmas and couldn't believe all the amazing tales I got for such a low price! Additionally, I got the neat cover art, which is very sweet and Christmassy. Everything by the Classic Tales audio family I've ever listened to has been of high quality and great value. Thanks for producing such fine work! Merry Christmas! From Theresa H of Albany, Minnesota on 12/28/2011 . From Emily of Springfield, Oregon on 12/22/2011 . I love this collection! I had Christmas gifts to make and I listened to this download, and the time just flew. I enjoyed listening so much. A Christmas Carole was wonderful and there are so many good recordings out there of A Christmas Carole, but I think I have never enjoyed one as much as I did this one!